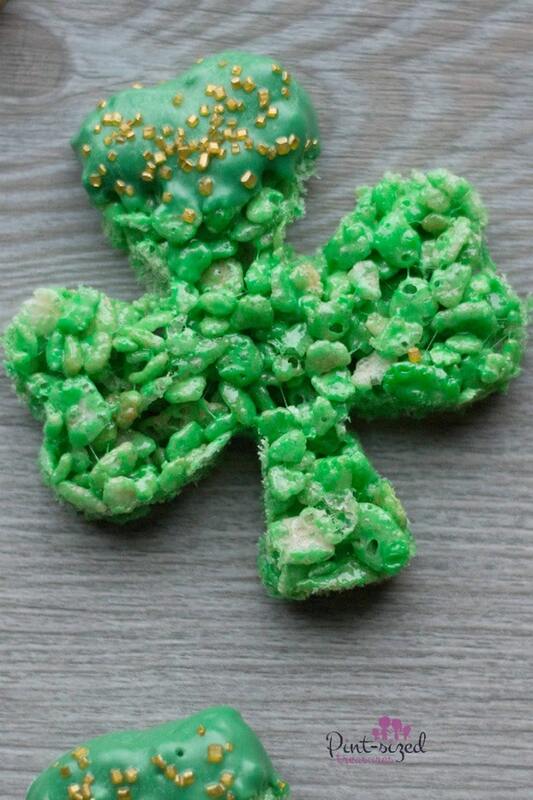 Shamrock Rice Krispie Treats are Perfect for St. Patrick’s Day! Ready for St. Patrick’s Day? 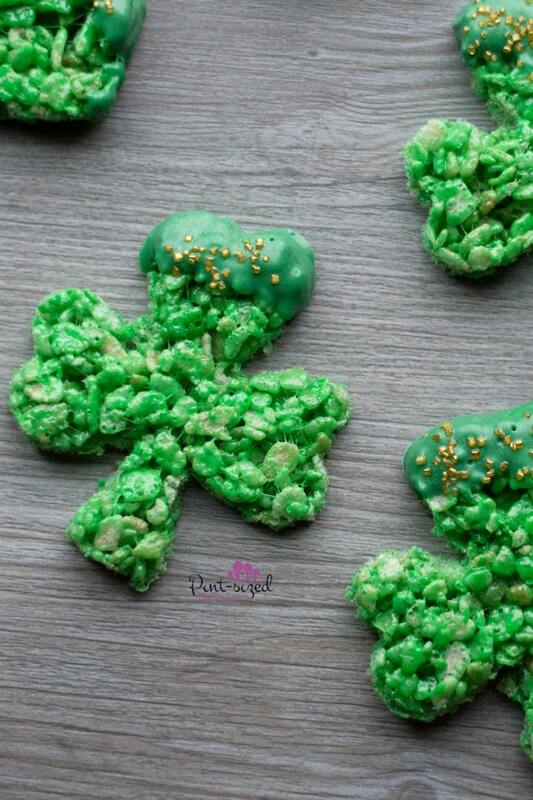 Totally easy shamrock rice krispie treats are the perfect way to go green on St. Patty’s day! Sometimes colored rice krispie treats don’t turn out so…well…pretty. And our family? Well, we like pretty rice krispie treats! And we cracked the code for brilliant colors! 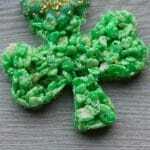 How to Make Your St. Patrick’s Day Rice Krispie Treats GREEN! St. Patrick’s day wouldn’t be the same without gorgeous rainbow colors, right? Just like all the beautiful colors in these simple rainbow wands for St. Patricks’ day that kids can make! Ready to know the secret to perfectly, vibrant rice krispie treats? Gel food coloring, not liquid. And for a gorgeous melted chocolate tip? Those are always my first choice when working with decrative, melted chocolate! We used green candy melts like these in the recipe. They work great! They’re definitely our best friends when we create fun-shaped and themed rice krispie treats! You can grab a shamrock cookie cutter here! Every time we make rice krispie treats someone has to guard the pan of treats! Kids can’t wait to much on the buttery, ooey-goey treats. We always make sure we add a few more marshmallows so our treats are nice and gooey! 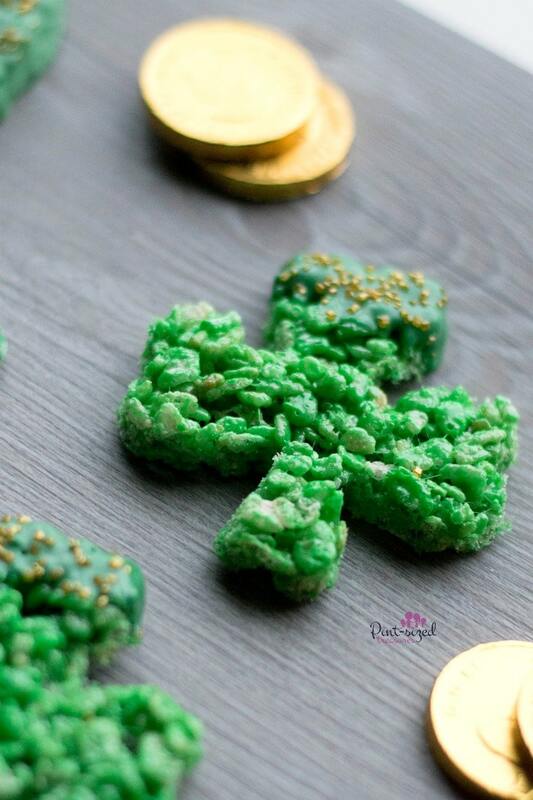 And if you love marshmallow, you’ll love this St. Patrick’s Day Recipe too! Don’t you love the little gold sprinkles in these cute treats? Those little details matter if you really want to go all out and make a St. Patty’s day celebration the BEST! When You Should You Add Sprinkles to Shamrock Rice Krispie Treats? Just sprinkle them on top of the melted chocolate as a tiny, super-cute, finishing touch! These adorable treats can be made several days head if you’re on a tight and busy schedule! Just keep them covered and refrigerated. 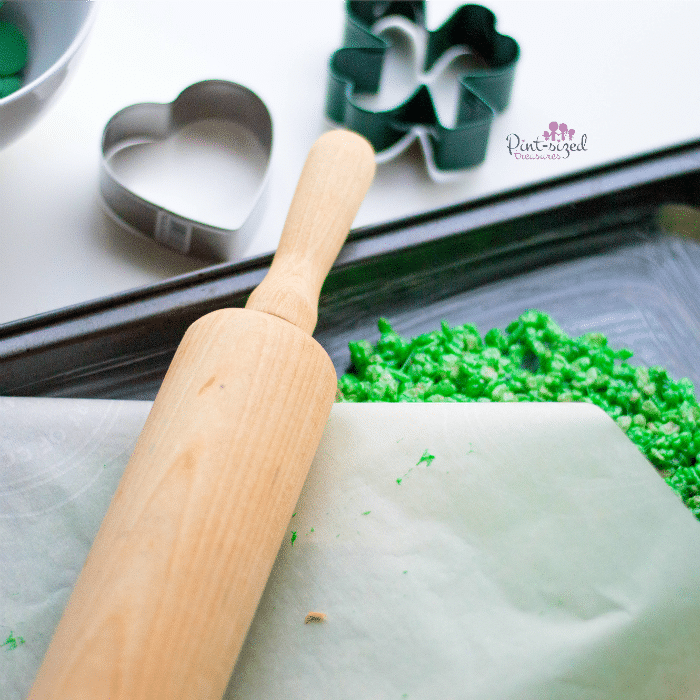 And if you want a a sweet and salty St. Patrick’s Day recipe, then check out these shamrock pretzels! Yummy! 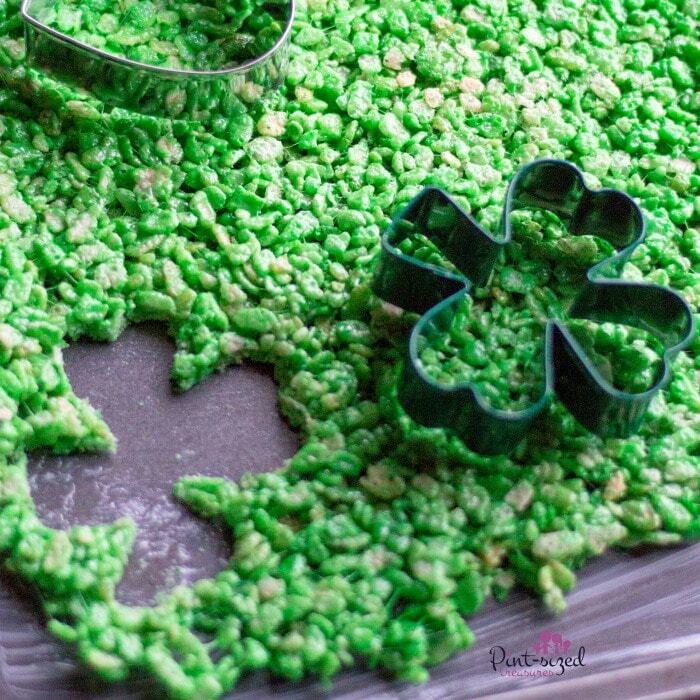 Can You Make Shamrock Rice Krispie Treats Ahead of Time? One sneaky tip for making these a few days ahead? Freeze or refrigerate the treats, but leave the chocolate tipped ends for the day you’re serving the shamrock treats. Chocolate-dipped goodies seem to be more appealing if they’re made the day of instead of prior. It’s simply an aesthetics preference, so there’s still no danger in dipping and refrigerating or freezing them prior. You would need to ensure that nothing touches the dipped chocolate so there aren’t crazy indentions in your beautiful treat creations! If you’re interested in more treat ideas that have a creative spin to them, check out our other rice krispie treat recipes below! Ready to celebrate St. Patrick’s Day with a crazy-cute Shamrock treat? You’ll find the printable recipe below! Be sure to join our recipe group on Facebook — Fave recipes for Families! 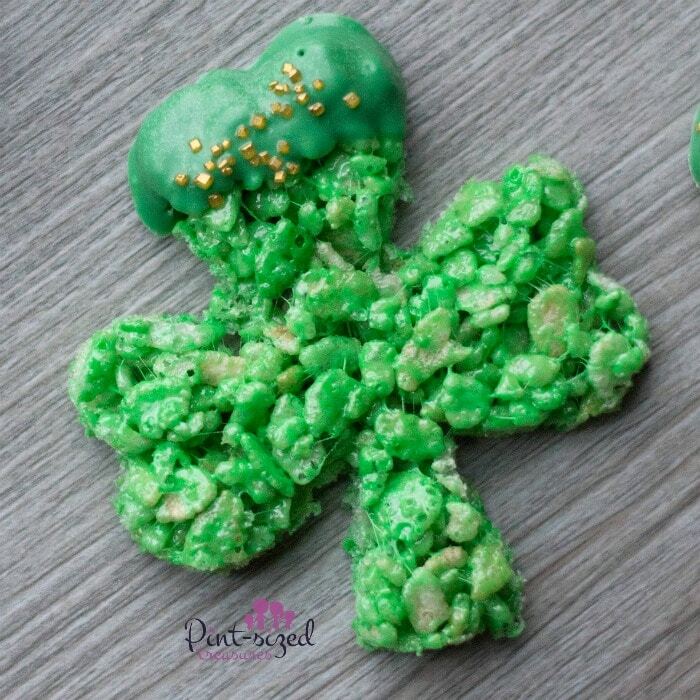 Easy, shamrock Rice Krispie treats are perfect for St. Patrick's day! They're brilliant green, dipped in chocolate and covered in gold sprinkles! SO fun! Coat a baking sheet (cookie sheet) generously with butter and set aside. Add marshmallows and stir constantly until completely melted. Once marshmallow mixture has melted, add vanilla and fold. 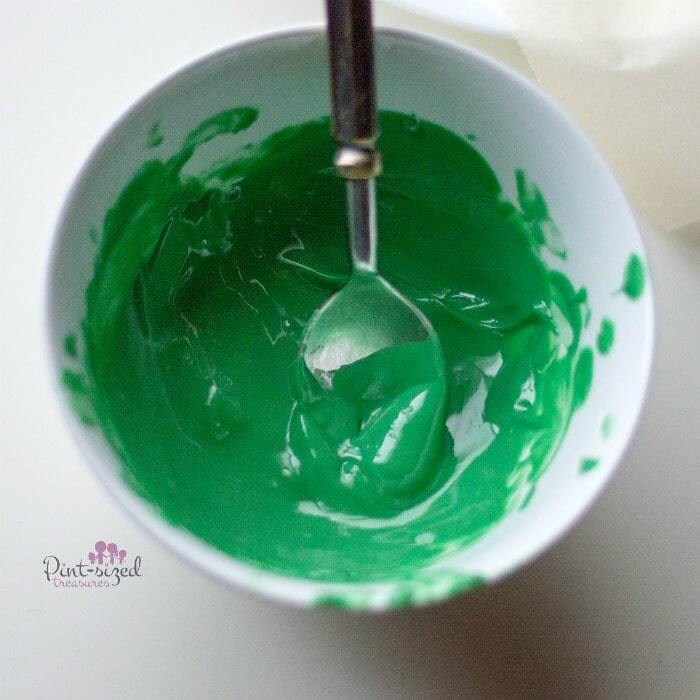 Add food coloring and stir until marshmallow mix is completely colored. Remove from heat and slowly stir in rice cereal. Place gooey rice mixture into your buttered baking sheet and spread evenly. 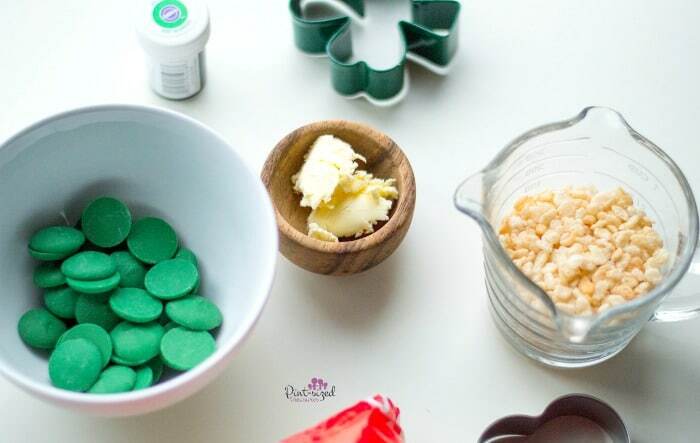 Lay a piece of parchment across the cereal treats and use a rolling pin to create an even top (these cereal treats are thinner than most). Place on a separate baking sheet (lined with parchment paper). Microwave candy melts and coconut oil in 30-second intervals until completely melted. Dip a portion of each cereal treat into candy melts and place on lined baking sheet. Sprinkle the chocolate portion with the gold sprinkles. Serve immediately and store in fridge for up to five days.